Alchemy is the medieval forerunner of modern chemistry. It can also be seen as a symbolic metaphor for the growth of consciousness. The classic understanding is that alchemists were attempting to ‟turn lead into gold.” Too many people read this on a concrete level and think these silly old medieval magicians were actually trying to physically accomplish this. Some probably were. But a deeper reading of this phrase is all about taking the darker elements of your life and finding the positive aspects of it. It is ‟finding a silver lining in the darkest cloud” rendered in more esoteric language. It is creating a work of art out of the raw elements of your life. I was reminded of this idea this week through a variety of experiences and encounters with art. I want to talk about them. I’ve already discussed my reactions to the death of David Bowie in my previous blog, so I won’t dwell on it again, except in the context of this post. Suffice to say, that was how the week began and created a framework for where my head was all week. Bowie was diagnosed with cancer eighteen months ago. He knew he was dying. He spent the last year and a half of his life creating the album Blackstar. Knowing that now, listening to it creates waves of resonance it wouldn’t necessarily have otherwise had. He took the time he had and spent it creating art out of his experience. It was an attempt to sum up and make peace with his life, to say goodbye to his family and fans and life. It seems that he found meaning in his sickness and suffering through expressing it in his art. Ziggy Stardust may have been an imagined figure of light, but David Bowie made the darkness conscious by finding gold in the face of his own demise. Wednesday at the comics shop saw the release of Rosalie Lightning, the new graphic novel by cartoonist Tom Hart. I have a small connection to this through his wife, cartoonist Leela Corman. I don’t know Leela personally. Though we have never met face-to-face I have had the pleasure of collaborating with her. Last summer she drew the story I wrote about Raoul Wallenberg for the upcoming second issue of Chutz-POW!. 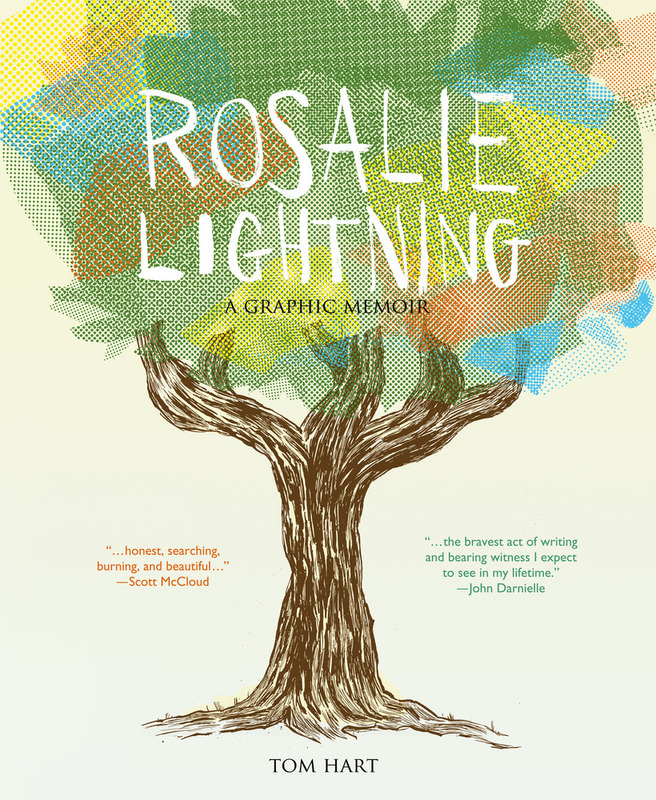 Rosalie Lightning tells the story of the sudden loss of their two year old daughter in 2011. I didn’t know this about Leela when we were sending emails and scripts and drawings back and forth. There was no reason I should have. This graphic novel is an amazing work of bravery. Tom Hart lays bare the unbearable sadness and depression he and Leela experienced. It is a difficult book to read and I’m not ashamed to admit that I cried tears throughout. But it is a worthwhile read. I hope creating this book and sharing it with the world is a healing experience for Leela and Tom. As difficult as this subject matter is I believe it can also be a healing experience for others who have experienced a similar loss, and for creating empathy and understanding in those of us who have not. Tom Hart took one of the absolute worst things that can happen to someone and created transformative art. Speaking of Chutz-POW!, on Thursday evening I was invited to speak at the Holocaust Center of Pittsburgh for their monthly Wechsler Session. Drew Goldstein, the Chutz-POW! project head, and MarcelWalker, lead artist for the comic, were also guests. We have all spoken about this project many times. The whole idea of Chutz-POW! from the beginning was to focus on the acts of heroism during the Holocaust instead of the horror and tragedy. We have been trying to tease out the gold from this dark time from the beginning and as the writer of the project I have been constantly amazed at the examples of shining human spirit in the face of some of the worst circumstances in history. On Thursday we heard Holocaust survivor Moshe Baran speak. Mr. Baran was one of the five people I wrote about, and while I had met him before this was the first time I’ve heard him speak in public. He is 95 years old and a survivor of the Jewish ghetto of Krasne, Poland, and spent two years as part of a resistance group living in the forest and fighting against the Nazis. He told the same story I had written, the same one that Marcel had drawn. As he spoke we pulled out the comic and followed along. I have known from the beginning of this project that I had been entrusted with people’s lives. I took this very seriously. But, no matter how much research I have done, I have always worked at a remove. They are stories. Hearing him speak brought it to life. This was not just a story. This was his life! This narrative Marcel and I had created is a small window into this enormous true life experience. I hope that our efforts to keep these stories alive have an impact on those who read them, but it is Moshe, and his late wife Malka, a survivor of the death camps, who truly found gold in their experience. They were both active throughout the rest of their lives, through speaking engagements, through her poetry, through their faith and continued engagement with life, in keeping their stories alive and inspiring others. Mr. Baran said that he has been asked many times in his life how he was able to keep his faith, given everything he had experienced. He said that to give up his faith would have been the same as saying the Nazis were right, and he refused to give Hitler a posthumous victory over his soul. This is not just finding a silver lining. This is being a figure of light. On Friday I went to the Arcade Comedy Theater in downtown Pittsburgh to see an old friend, David White, perform his one man show Panther Hollow. David and I were parts of a larger social group, and though he and I never hung out a lot back then we were at a lot of the same events and parties and I’ve been happy to stay in touch with him over the intervening years. David is an actor and a playwright. Panther Hollow, an autobiographical piece, premiered off Broadway this past November. For those of you outside of Pittsburgh, Panther Hollow is a ‟hidden” neighborhood near the University of Pittsburgh where White lived during his years in grad school. The performance begins with the true story of the time he found a dead body there, hanging in a tree near his house. From there the performance is both poignant and hysterical. It is a collection of anecdotes from his life, centering on the theme of the depression he suffered at the age of twenty-five and how, at the time, he thought the guy hanging from the tree may have had the right idea. The show is brilliant, and I don’t say that just because I know David. It is honest and brave and funny in the face of despair. It’s also an important show, because it confronts the idea of depression and mental illness head on. These are still taboo topics for way too many people. David shares very personal and embarrassing moments of his life in a way that is gentle and caring and empathetic. If even one person who suffers depression comes away from this show better able to talk about it and not be embarrassed then David’s art has served an even greater purpose. At one point in his script, David says, ‟I put my head on his shoulder no matter how uncomfortable it is because sometimes you have to feel uncomfortable so that someone else doesn’t feel so alone.” I guess maybe that’s what I’m trying to say about art with all of this. The best art is the act of transformation. Of taking some of the darkest moments of your life, the ones we all have simply by virtue of being human, and transforming them into something greater, something that rises above the dross of merely being, something that touches the spirit of other human beings and allows them to recognize a piece of themselves in your suffering.